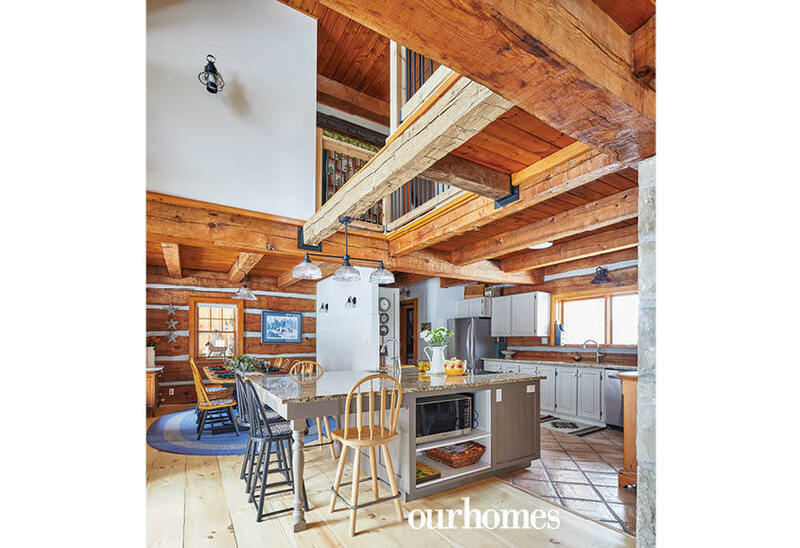 A version of this article originally appeared in the Holiday/Winter 2018/19 issue of OUR HOMES Wellington County, Orangeville, Caledon, p.60. Find local businesses in our Wellington directory. 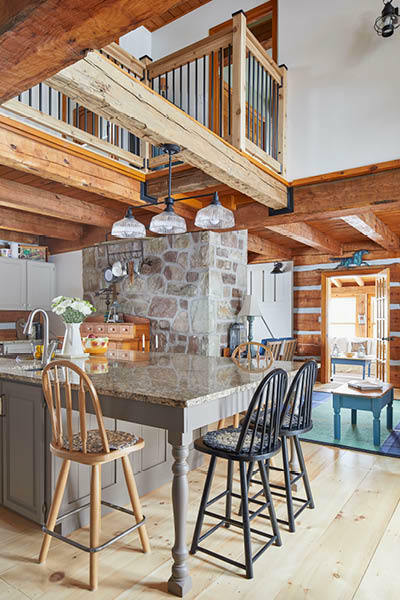 “Once you’re bitten by the log bug, there’s no turning back!” says this British Columbia couple who recently relocated to Ontario's Caledon Hills. They left their log home in B.C. 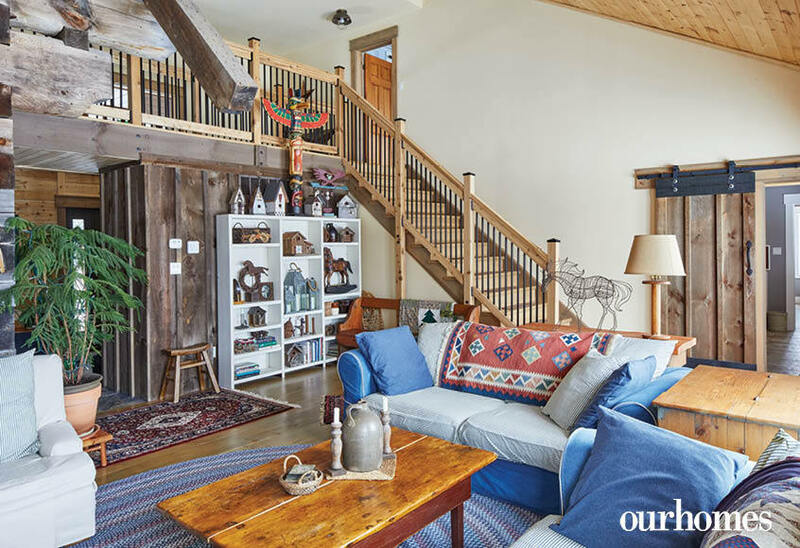 and searched the hills for a property that would suit their must-have list: lots of room for dogs and horses, spectacular country views and the prerequisite log house. 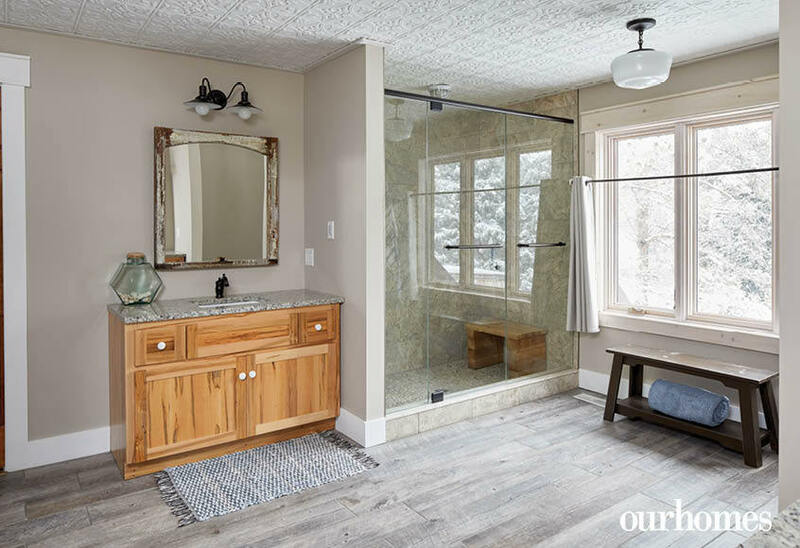 They planned an addition and renovation to triple the size of the original kitchen, and add a great room and mudroom/laundry room on the main floor. A master suite was planned for upstairs. They juggled the floor plan like pieces of a puzzle until they got the flow they wished for while accommodating a tall maple tree and existing well head. They approache Ted Bryk and Mary Lawson of Dalerose Country to handle the construction. Dalerose moved the staircase to the rear of the house, which brought more light to the entryway and into the centre of the existing home. Bryan’s Fuel installed a propane furnace, propane tank, and duct work in the new addition as well as ran ducts into the existing part of the home. 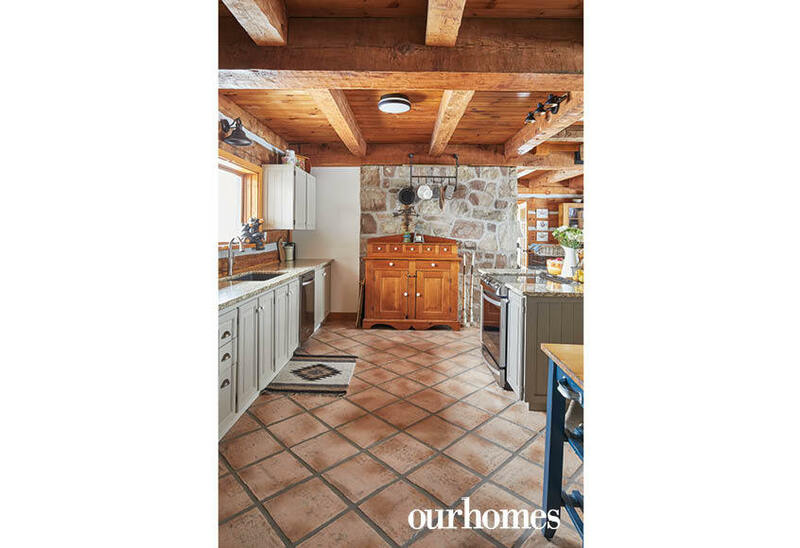 The new design opened up the main floor for a generous kitchen which boasts a five-and a-half by eight-foot island topped with a giant single slab of granite. The new great room allows for spectacular views of this country property. A wall of birdhouses is a charming example of the owner's love of collecting. A catwalk connects the addition to the original structure. On one side, it leads to the spacious master suite. In the original part of the house, one bedroom was sacrificed to create a hallway between the two guest rooms. 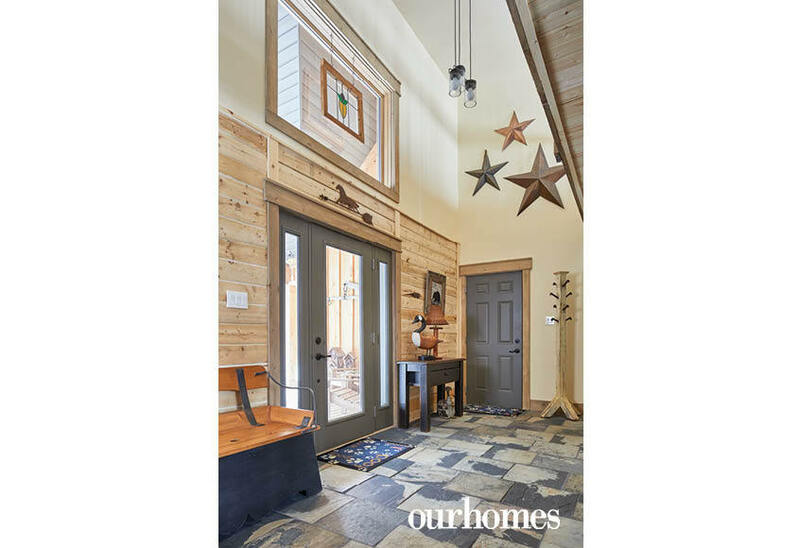 Outside, an attached garage and a large front porch complement the style. 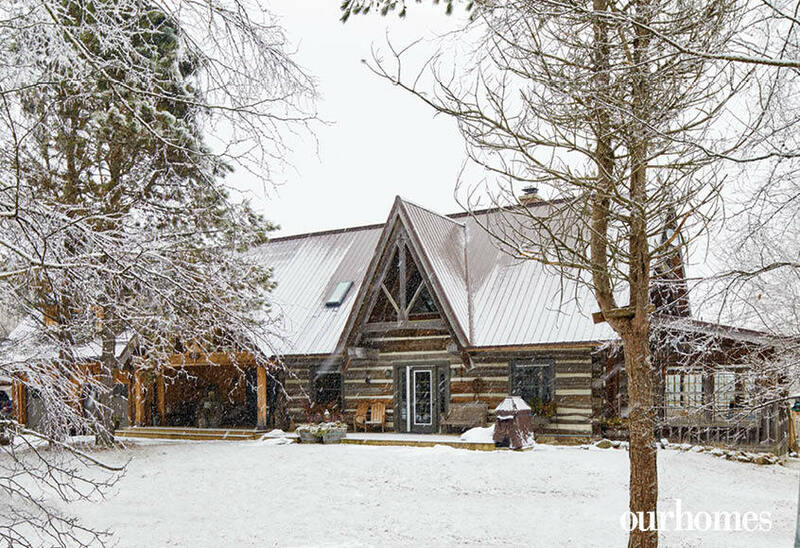 The original chinked log home on this property had a bright sunroom (pictured to the right). A large addition to the left incorporates a two-car garage, great room and master bedroom suite. Old meets new on the welcoming front veranda – a favourite year-round, storm-watching spot for the residents. 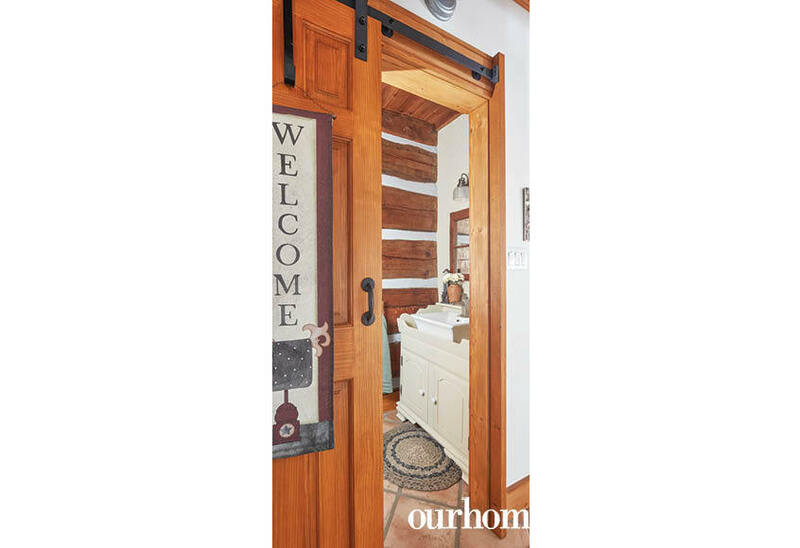 The original chinked logs pair with cedar board-and-batten on the home’s addition. Placement of a large window above the foyer doors was critical to allow views from the catwalk and light into the foyer and great room. 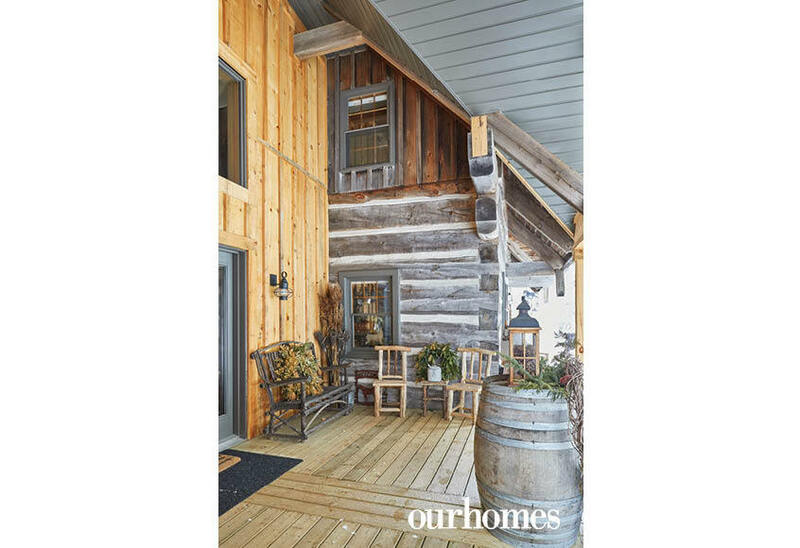 Moving the existing staircase and shifting it to the back of the log home was pivotal to all other layout decisions in this great room addition. The blending of old and new roof structures takes centre stage in the new great room. 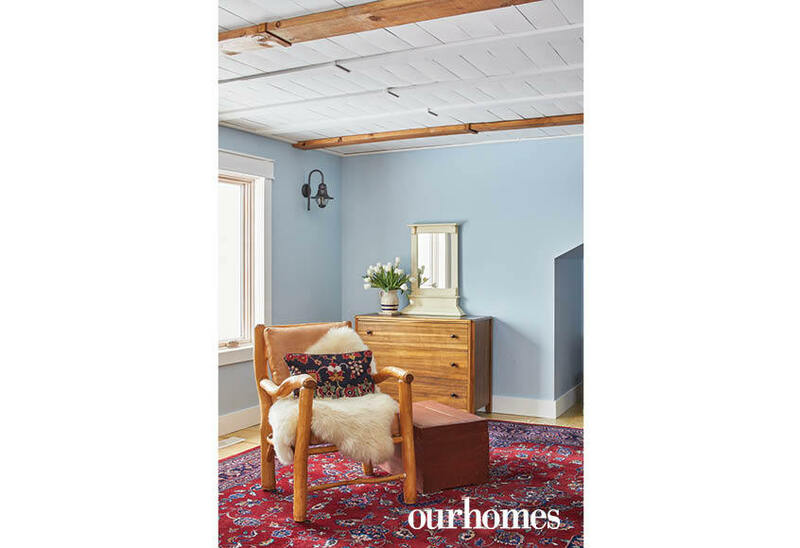 A canoe-shaped shelf and blue and red braided rug add character, along with multiple horse figurines. 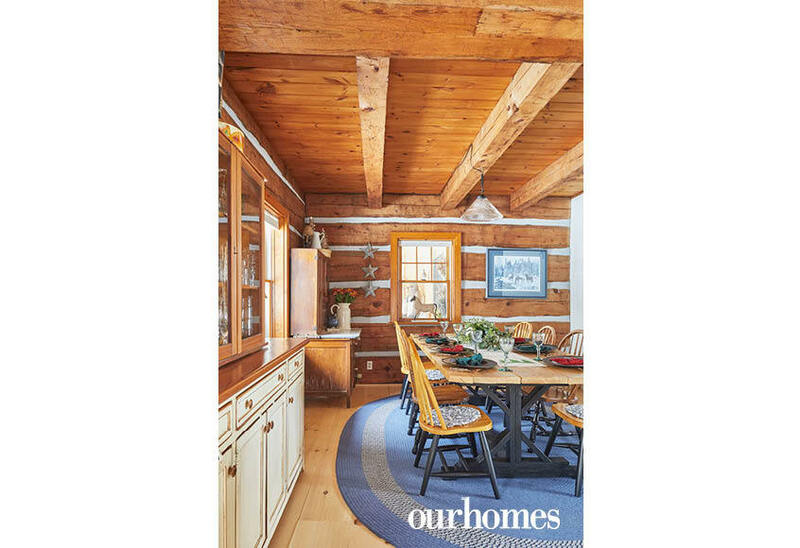 The home’s post-and-beam addition tripled the size of the kitchen. The space between several beams overhead is open to reveal the upper level catwalk. 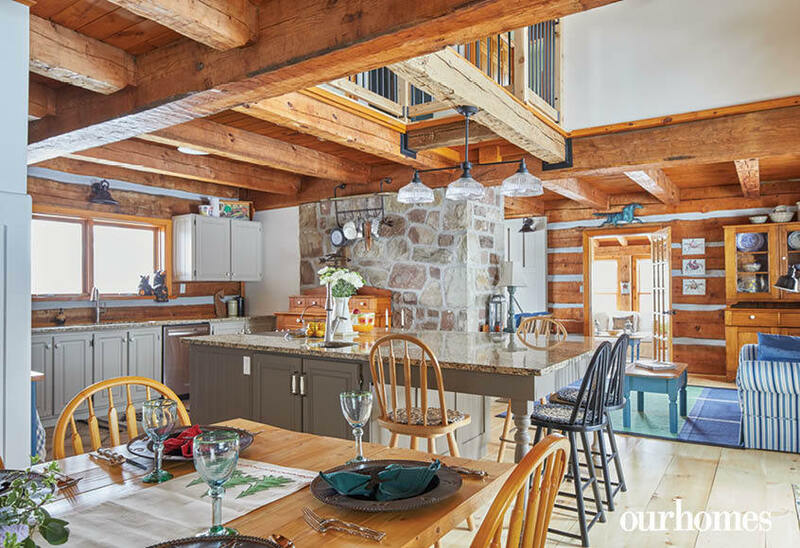 A large island topped with a giant slab of granite anchors the kitchen, where all tend to gather in this log home. The removal of a staircase created space for an open-concept kitchen and allowed natural light to flood the room. 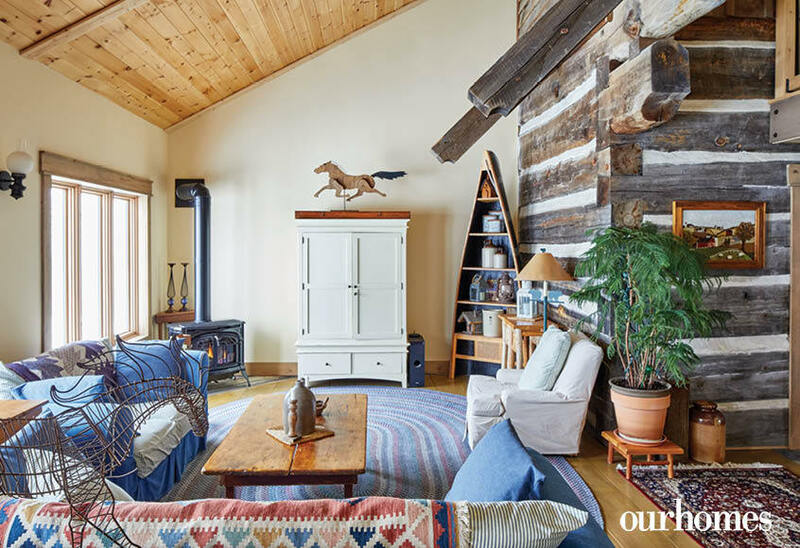 The home’s original central stone hearth is a lovely backdrop. A braided, blue rug keeps toes warm at the dining table. The hearth room offers many cosy seating areas. The sunroom is original to the log house, built off one end. The four-season space is a beautiful spot to watch the horses in nearby fields. Slipcovered sofas are easy to keep clean or update when styles need to be refreshed. 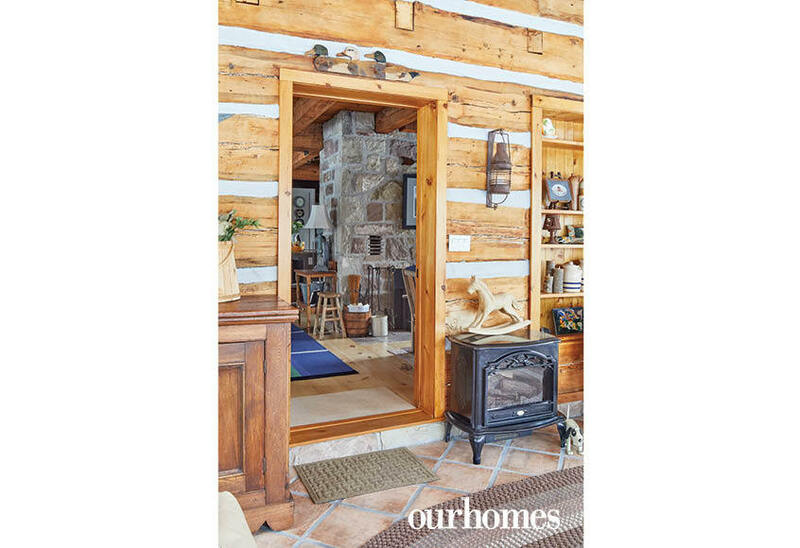 The original log home had a central hearth to keep the whole house warm. 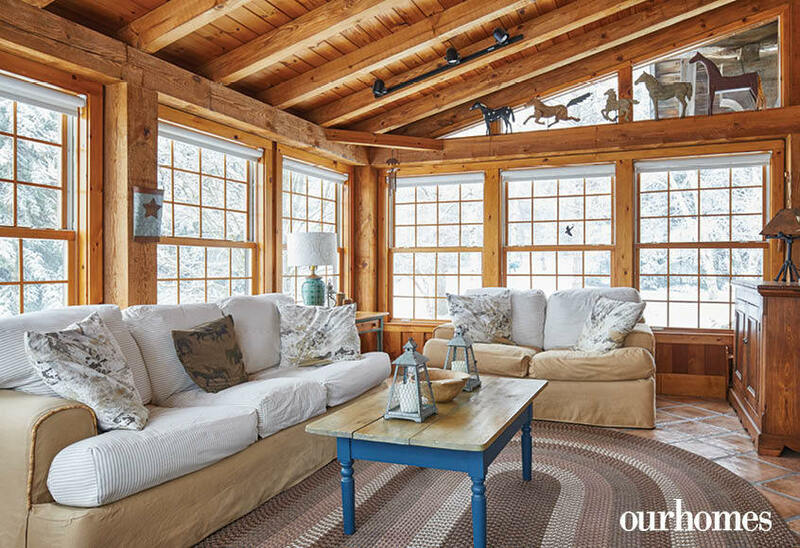 Off the kitchen in the sunroom, a small stove and braided rugs create a cosy conversation area. The two-piece powder room is tucked off the kitchen behind a sliding door. The vessel sink sits on a platform vanity. This ever-important mudroom and laundry room is large enough to remove mucky boots, clean dirty paws, and shed wet coats. 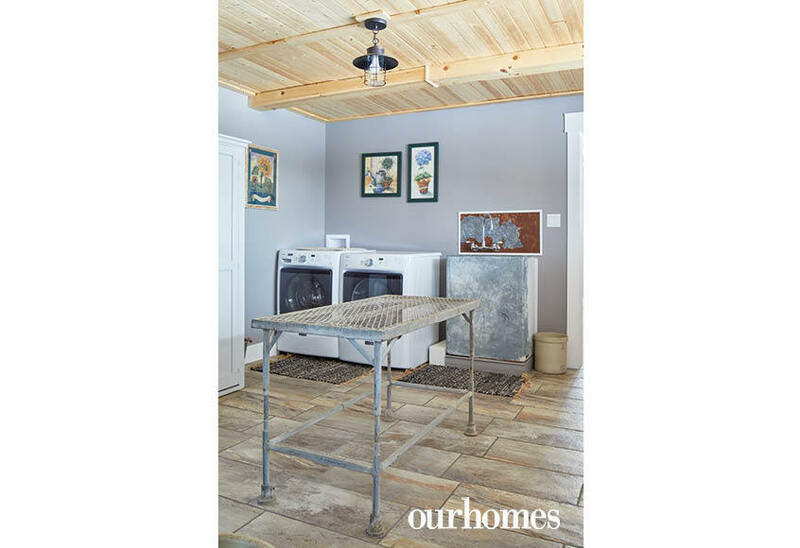 The laundry area is outfitted with a galvanized table for folding and a farmhouse sink. 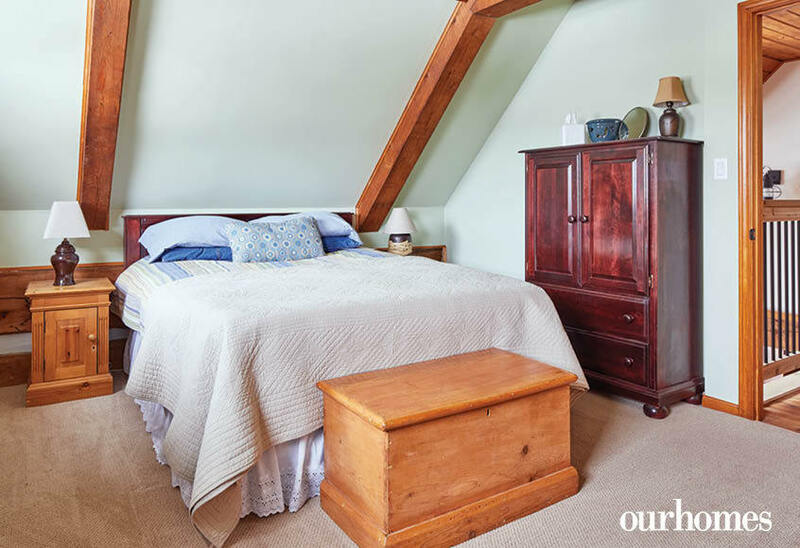 This original master bedroom is now a cosy suite for guests. 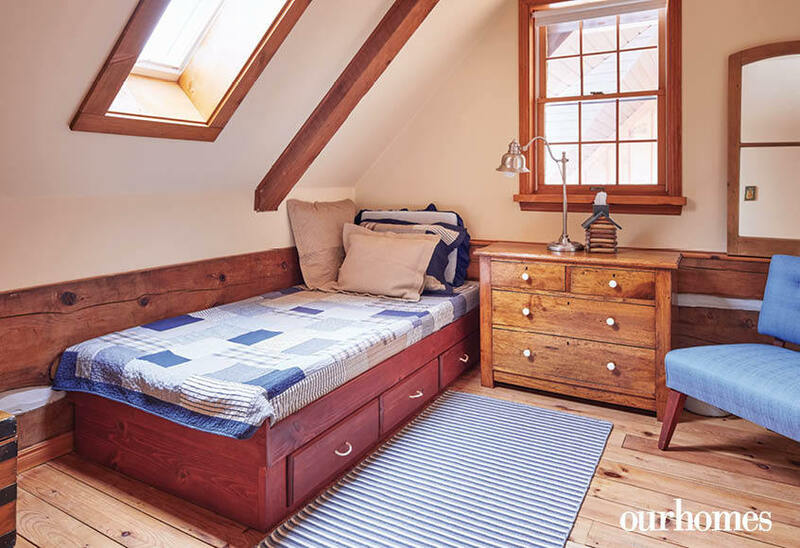 This charming under eaves guest room is often used for sewing by the light of the new skylight. 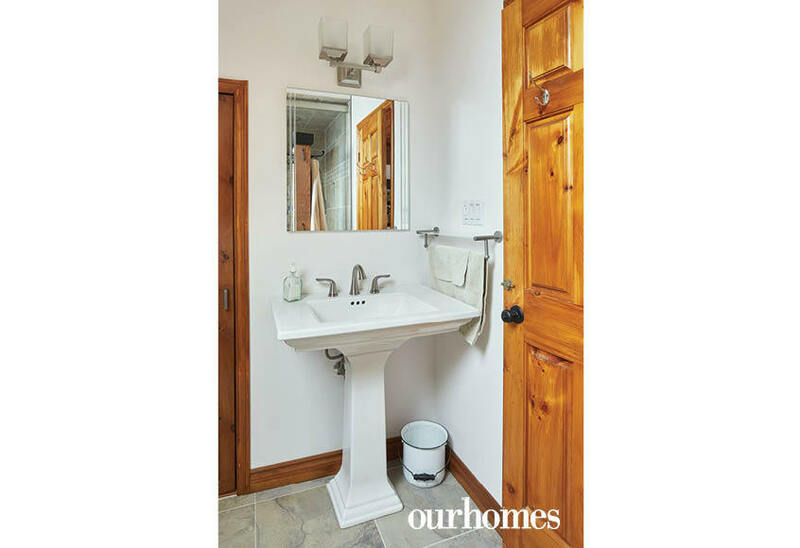 A classic pedestal washbasin in the powder room is in sync with the country-home flavour. 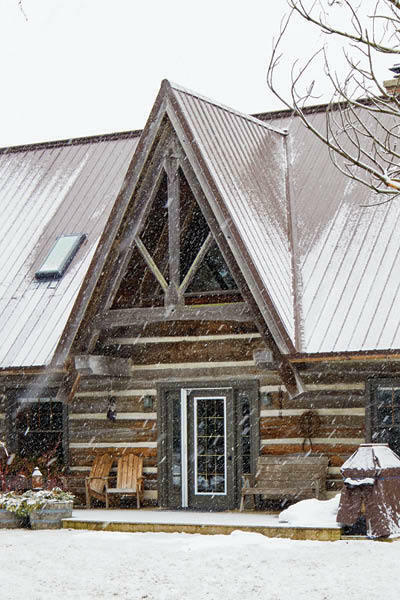 To conceal plumbing in a log structure, sometimes bulkheads and steps are necessary to conceal mechanical elements like plumbing. This shower in the guest bathroom is tucked under the eaves. 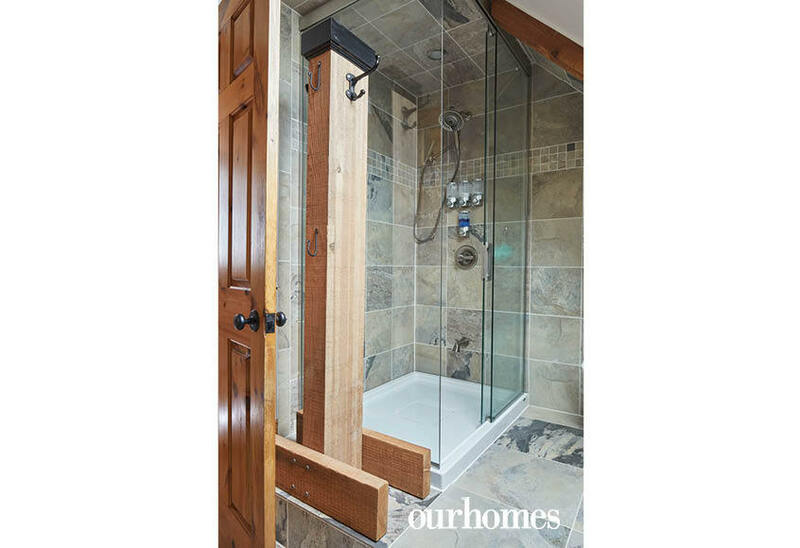 A beam leftover from the build is installed vertically with hooks attached for a towel and robe post. 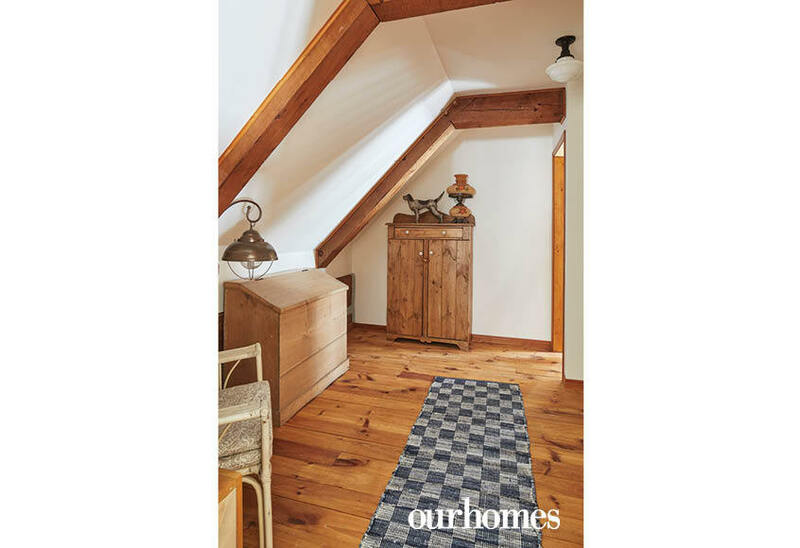 On the upper floor, one of the original small bedrooms was sacrificed to create a hallway that connects two reconfigured and enlarged guest rooms, each with its own en suite. 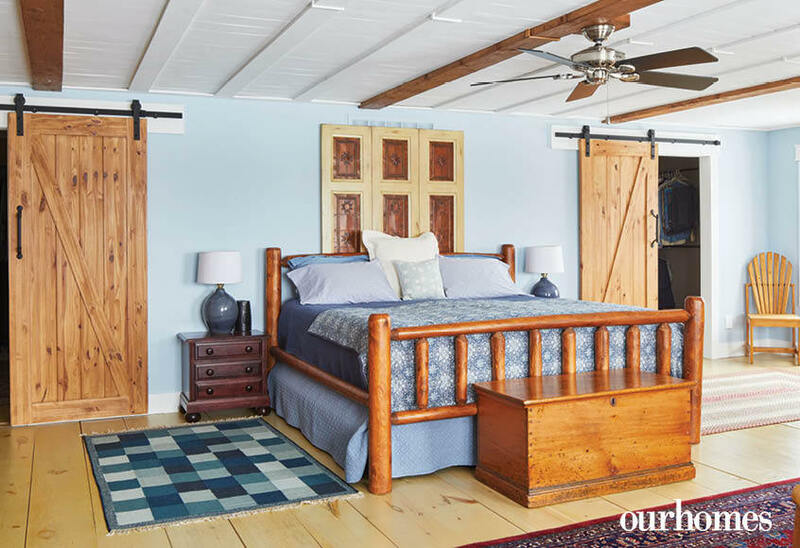 In the large master suite, barn doors on either side of the bed lead to his-and-hers walk-in closets. 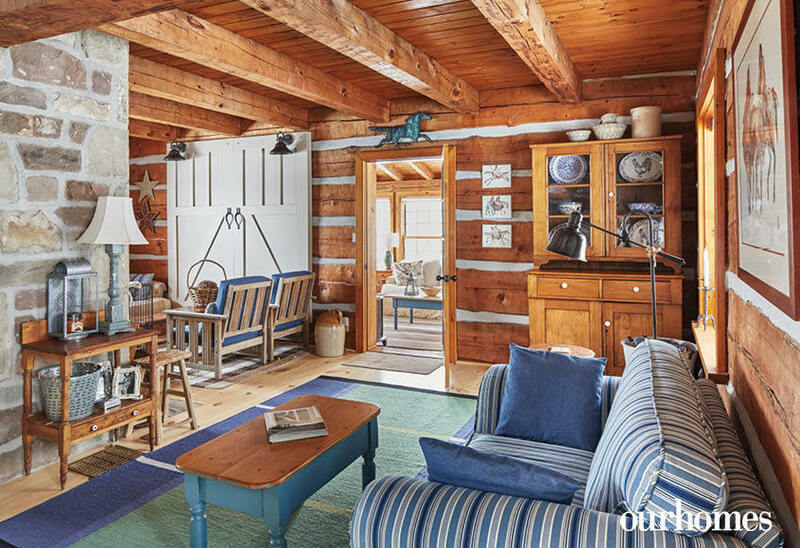 A pine log bed is a nod to the style of this log home. This bonus space in the master suite was created when the veranda below required a certain ceiling height. Tin ceilings and porcelain century plank-style flooring completes the sizeable country master en suite.